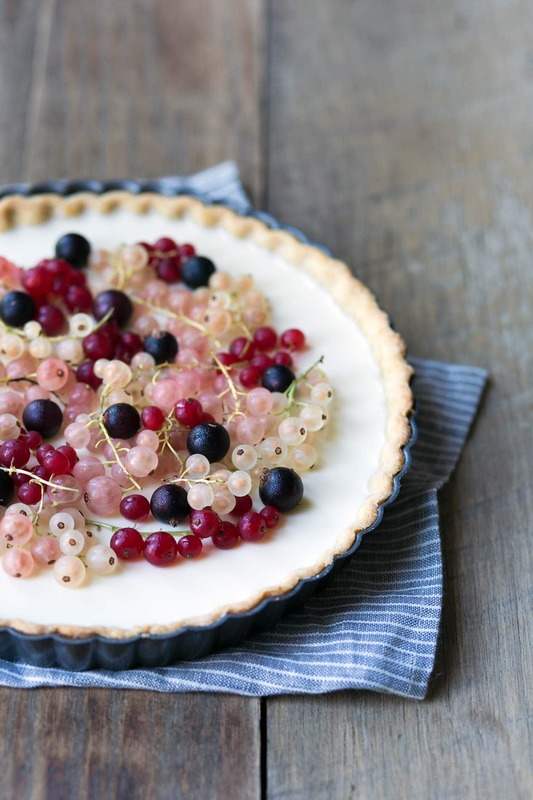 This Mixed Currant Panna Cotta Tart is a light, beautiful dessert that will wow your guests! Every now and then I get my hands on an ingredient that I find myself wanting to showcase as the centerpiece of a recipe. When I saw these mixed currants in my CSA basket, it was love at first site. I had never received a mixture of colors like these before. I hesitated with regards to a blog post, because I know most people won’t have access to mixed currants. So it’s worth noting up front that you can modify this tart based on what’s available to you. It will work with a single variety of currants, or you can swap them out entirely for something like blueberries. Cooking these beauties was out of the question. I couldn’t even bring myself to remove the stems, though I know that will raise some eyebrows. Feel free to remove the stems before laying the currants on the panna cotta. I just… couldn’t help myself. 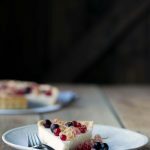 The way I see it, this tart is a showpiece meant to be presented and then served up for guests in a more realistic manner, much as one might present a tiered cake or a whole turkey at Thanksgiving. See the last photo for how I actually served each slice. Also take note that the prep time is mostly inactive. Also, be sure to check out my tips for working with tart dough. 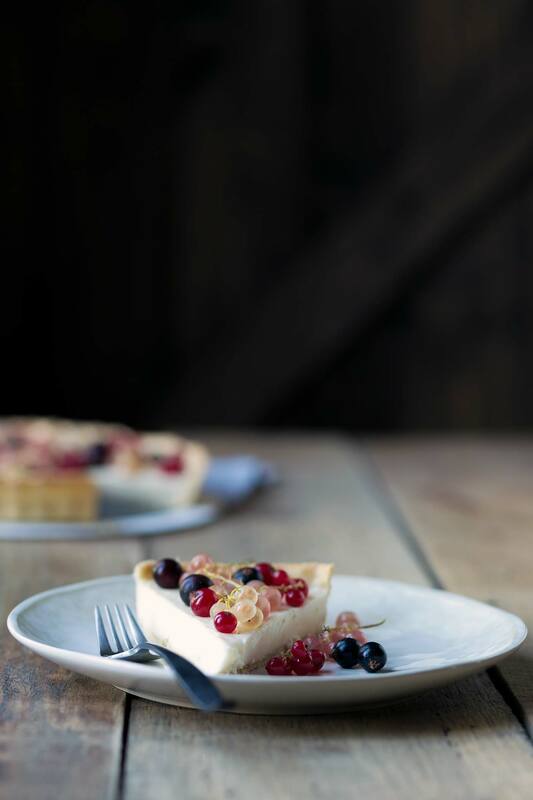 This Mixed Currant Panna Cotta Tart is a light, beautiful dessert that will wow your guests! Serve as a finale to an Italian meal to make a statement. Place the flour and sugar in the bowl of a food processor. Pulse several times to combine the ingredients, then add the butter and pulse a few more times until the mixture resembles coarse cornmeal. A few larger pieces are fine. In a liquid measuring cup, briefly whisk together the yolk, water and vanilla. With the machine running, pour the liquid in until the dough has just barely formed. Turn the dough out onto plastic wrap and flatten into a disc. Wrap and chill for at least 2 hours. On a lightly floured surface, roll the dough into a circle approximately 12 inches in diameter. Roll the dough around the rolling pin and then unroll it into a 9-inch fluted tart pan, leaving slack so the dough can settle into the flutes. Gently shape the dough to the side of the pan and trim away excess dough (if possible, leave 1/4 inch overhang to account for any shrinkage while baking). Meanwhile, preheat the oven to 375 degrees F. Use a fork to prick numerous holes in the dough to prevent air bubbles. Add a layer of aluminum foil and top with dried beans. Place the tart pan on a baking sheet and bake for approximately 20 minutes, removing the beans and foil halfway through, until the dough has just firmed up on the bottom. Allow to cool. Place the gelatin in a large bowl with the lukewarm water to soften for 5 minutes. In a medium saucepan, bring the cream, milk, sugar, and vanilla to a simmer over medium-high heat, stirring until the sugar has dissolved. Remove from the heat and pour into the bowl with the gelatin, whisking until smooth. Carefully pour into the tart shell and place in the refrigerator to chill until the panna cotta sets, 2-4 hours. 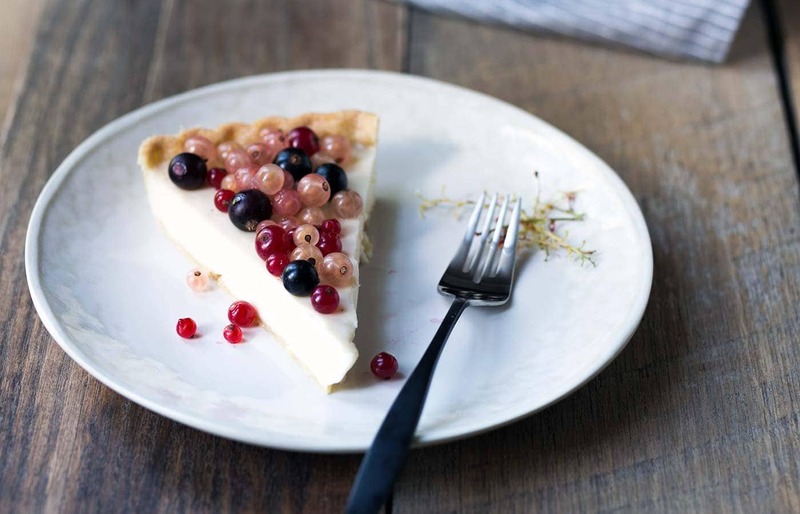 (Note: To avoid spills, you might want to place the tart on a shelf in the refrigerator and pour the panna cotta mixture into the shell there so it doesn’t need to be transferred while the mixture is in liquid form. It will be easier to do this if pouring from a bowl with a spout). One the panna cotta is firm, gently layer the currants on top. You can either remove the currants from the stem, or leave them on as garnish. 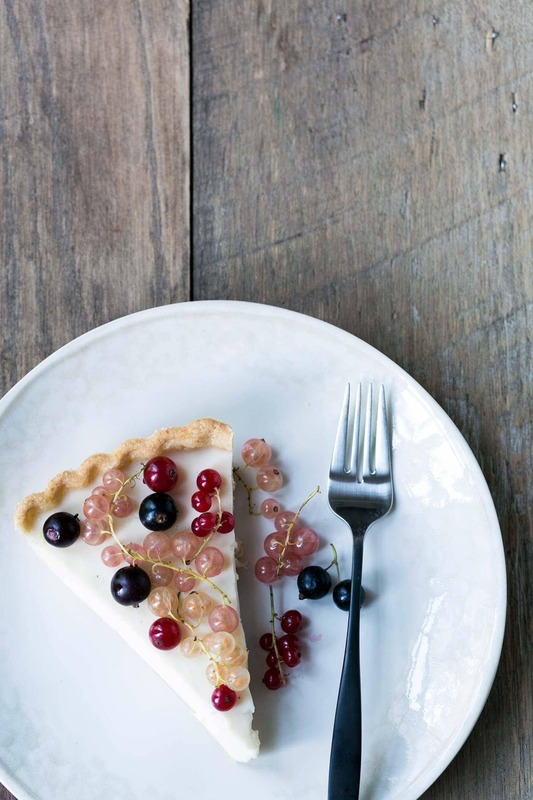 While this makes for a beautiful presentation, it will require that you remove the currants while slicing and serving the tart. Mixed currants, while beautiful, are difficult to locate. You can substitute a single color (red, white, etc), or use a different fruit altogether. 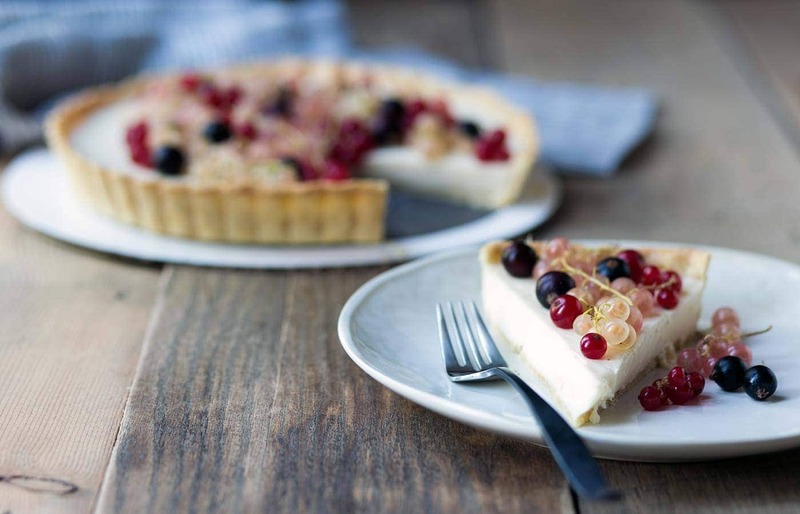 For example, this tart would be beautiful with blueberries or raspberries. I used a Wilton 9x1-inch tart pan with a removable bottom. I am not very familiar with currants. They are so pretty! What a beautiful panna cotta. WOW. 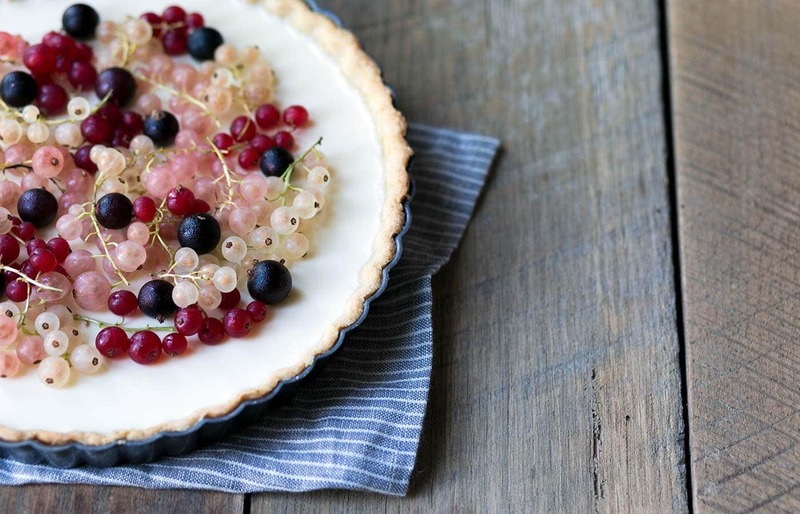 That is quite possibly the most gorgeous tart I have ever seen. I would kill for a slice of this tart! Plus, those currants! Gorgeous! Wow, I bet this tastes awesome against the crunchy tart! Stop with the temptation already!! 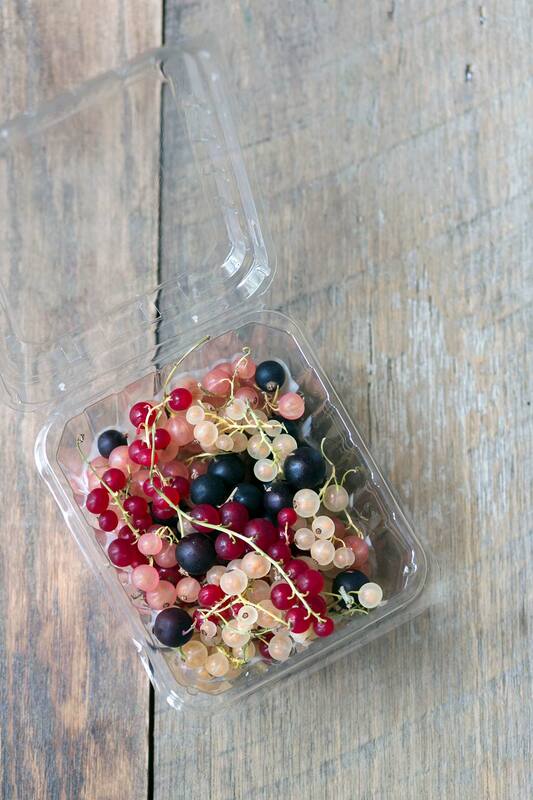 Currants are so hard to find around here, I need to try and get my hands on some…. because this tart is too pretty and delicious looking, I have to try! This is truly beautiful Jennifer. I do not have access to mixed currants and your notes are super helpful. Though I know that they are a food photographers dream ingredient this time of the year. You are a true artist, this is exquisite! Oh this is just gorgeous! The focus on the currants is beautiful! How much lukewarm water is used to dissolve the gelatin?